OpCache is a mayor tool to increase the performance of your site. Every time a WordPress page is visited the system needs to compile the php code in order to render the page. 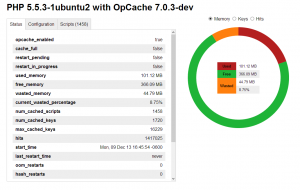 OpCache allows you to store those compiled bits in memory and serve them much faster. If used correctly Zend OpCache would identify a change in the physical file and reload the compiled code into the memory cache. I read that it can increase your speed almost 10 fold! In my case I didn’t notice much of a difference but then again maybe my server is just that good 😉 But seriously speaking this is a great feature, the server is showing 99.84% cache hit which is really good. ; The maximum percentage of “wasted” memory until a restart is scheduled. ;size of the optimized code. ; that don’t need them anyway. ; that start with ‘x’). Line starting with a ; are ignored (comments). ; The default value of “0” means that the checks are disabled. ; OPcache error_log file name. Empty string assumes “stderr”. I am not sure why but I am crazy about graphs, reports, statistics, etc. Seeing how effective your cache is and the management of system resources is something important. There are several OpCache monitors but I think OpCache-Status by Rasmuf Lerdorf is rather simple to deploy, simple and easy on the eyes. Importing WordPress sites: Why won’t the Import tool finish? WordPress errror while updating: Download failed. : Destination directory for file streaming does not exist or is not writable. How to configure wordpress to use ZendOPcache?